This year's event features music from three generations of Disney films, with scores from Mary Poppins, The Jungle Book, The Lion King, Beauty and the Beast, and The Pirates of the Caribbean. The program also tips its hat to Helena's 150th birthday with a new work, commissioned by the City of Helena and the symphony, composed by this year's composer-in-residence, Kile Smith. The fireworks display closes out the evening. 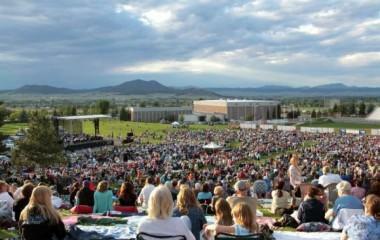 The Helena Symphony and Carroll College, who expect an audience of up to 15,000, encourage concert-goers to drop off lawn chairs and blankets Saturday morning, to reserve a spot on the lawn. (To protect both the lawn and fellow attendees, pets, plastic tarps, paint, rocks and stakes in the ground are not permitted.) In 2013, the tradition of holding down those blankets with canned goods and donating the cans to the Helena Food Share led to over 12,000 pounds of food being collected.